Do you have a list of programs that "worked" —temporarily? % Am I Hungry?Am I Hungry? Do you have a list of programs that “worked” —temporarily? Last week I was on the phone with a smart professional who’s really good at what he does. As often happens when people find out what I do, he shared what he’s tried in the past to control his eating, including some of the advice he’d been given by various people. If it’s not sustainable, then it doesn’t “work”! I try not to be rude, but it’s so frustrating to me that diet-culture has trained you to think that short term changes mean that their diets or lifestyle plans “work”—but when they stop working, it’s your fault. So, you’re right back to searching for something else to put your hope in (and waste your time and money on). I’m all for lifestyle changes, but if it’s not sustainable, then it didn’t work! Let’s show the world how hard we tried! In the Comments section below, let’s compile a list of everything we tried that “worked” but didn’t last. (I went first!) 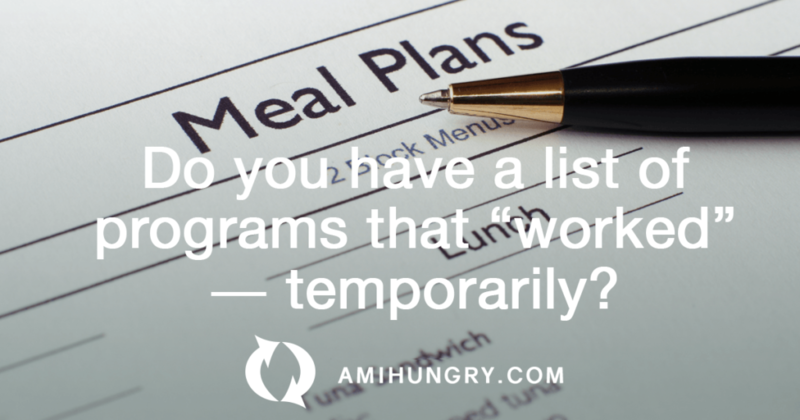 Using your first name only, write down your list of all the diets, plans, and programs you’ve been on. Maybe we can start to break down diet-culture’s lies by showing that we didn’t fail – the diets, programs, and plans failed us! When you follow these rules, then you’ll feel good. Aren’t you done postponing your life until you can finally stick to some magical formula? Aren’t you sick of all the ridiculous and unsustainable rules? Aren’t you tired of the restriction that leaves you feeling left out and helpless? Aren’t you exhausted from spending so much of your energy trying to stick to a plan that you can’t wait to get off of? How about trying something truly different? Some may still want to try another diet or extreme workout program. I get it; the allure of a quick fix is powerful and makes it easy to forget all the other times that didn’t last. But the person I want to talk to now is the one who is tired of the “latest and greatest” fad and is craving a lasting approach to crafting a vibrant life. When all the fads have failed you, when all the outside-in work you’ve done just leads right back to where you started, then it’s time to try an inside-out approach. HERE! 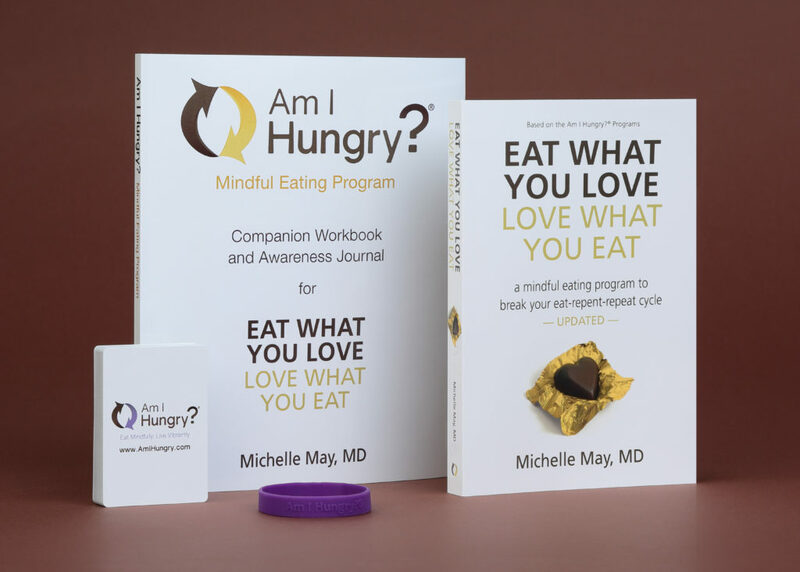 I have combined theses resources our community has fallen in love with into one complete bundle: Our Mindful Eating Toolkit. And you’ll save $15 on this popular bundle for the next 14 days! This toolkit is not about motivation, willpower, or short term results—it’s about transforming your relationship with food and what you believe about yourself. You shouldn’t have to say “no” to an amazing dessert or think twice about joining your friends for a night out. You shouldn’t have to spend so much of your precious time meal planning, logging food and exercise, or feeling guilty about a choice you made. You should be able to eat what you love and love what you eat. Our mission is to help you restore your relationship with food and put you in charge, listening to (and trusting!) your body, and feeling fully equipped to meet your needs. It’s a huge shift from all the crap (sorry, but that’s the way I feel) out there promising you that eating on a certain schedule, practically eliminating a certain food group, or even that their old plan “reimagined” is fundamentally different from everything else you’ve tried! Instead, I want to offer you an inside-out approach that will change the way you think about food… if you’re willing (and want to save $15 while you can)! I started dieting when I was about 12. I did a competition with my stepfather first, then joined Weight Watchers – which I did off and on for about 20 years! Somewhere in there I also did a doctor-supervised program that included drinking water with vinegar (yuk!). It must have been a low-carb plan because I remember them testing me for ketones every week to make sure I wasn’t cheating. I am SO glad that I’m done with all that! I’ve done Richard Simmons “Deal a Meal”, Low fat diet enhanced by Orlistat, Atkins,Phentermine with low calories and last year the ITG diet which is very low calorie low carb diet. I lost a lot of weight each time especially with Phentermine and the ITG diet. But here I am again ,I’ve put all the weight back on and then some! I am heavier than I’ve ever been. I have your book,and have had it for a couple months. I’m so frustrated I haven’t read it because I feel like it’s me and it is one more thing I won’t stick to. Love the idea of reviewing everything I’ve tried! 1. Liquid diet in the early 70s! Almost passed out because I was also limiting my water intake to lose more weight faster! I was completely clueless. My sister, who was also on this red liquid substance, lost a lot of hair! 2. Never actually tried Weight Watchers, although I went to 1 meeting. Because I only needed/wanted to lose 10 pounds, I wasn’t particularly comfortable in that group environment, nor did I fit in very well. 3. Starvation…ate very little and lost the 10 pounds and had an emotional breakdown (not a real one, but I was a bit of a mess). 4. Listing every morsel that enters my mouth. I’ve done this a number of times and it’s actually useful to see how quickly many items add up. I’m doing this again and find it helpful for a sense of focus, control and meets some hidden OCD characteristics. 5. Now I’m on my own pretty effective See’s candy diet program. I eat healthfully and in appropriate amounts and if I do so throughout the day, I may be rewarded with 1 piece of See’s candy, which I love and could eat a lot more of. So, although I’m almost 75 years old and pretty active, that damn 13 pounds returns every 3 to 5 years! And now I’ve again lost 5 pounds in 3 weeks.. so not so bad, but I do understand there are no magic “diets.” Just smaller portions of healthy, nutritious foods plus exercise.. nothing new under the sun. And the See’s seems to be working pretty well. U don’t actually have one every day, but I do look forward to it! I think I started dieting at 10! My mom wanted to lose weight and I needed to lose weight, so she dragged me to the doctor and we both went on a diet and were given diet pills. After a month, I had lost some pounds, but my mom hadn’t so we never returned to the doctor. As a teenager I joined Weight Watchers and experienced my first reaching of my goal weight on a very low fat diet. I could never sustain it, and honestly never really saw myself as thin enough. I’ve gained the weight back half a dozen times and kept going back (definition of insanity). I’ve also tried Nutrisystem with very short term success and I tried to go “healthy vegan”. I think at that point, my digestive tract was pretty much ruined and it couldn’t handle it. I had been suffering with Gallbladder disease since at least 18 yrs old. It was misdiagnosed until I was 24 years old and so sick, they could see it protruding from my abdomen. Once that was out, then the acid reflux started. Trying to eat vegan without any vinegar or spices was too brutal. Each time, I felt a failure and would gain more than I ever lost and blamed myself solely. Some people say they reward themselves with food or that food is their best friend – well that’s not my experience. I punished myself with food, telling myself the usual range of insults all equating to – I’m not good enough. Eventually, my health took such a bad turn that I considered BiPass surgery. I had the Sleeve in January of 2018 and had some issues and they ended up converting me to the BiPass in September of 2018. I still had some issues until recently. My digestive tract is like a battlefield and very wounded, But I have worked really hard with this TOOL and have shed 165 lbs and am just short of a reasonable goal. I am now focusing on mindful eating to take me across the finish line and become my new lifestyle. I started gaining weight when puberty hit (I was 10 years old). I leveled off at the age of 13 and held there until I left home at 18. I joined TOPS right away (my mother was in that program) because I wanted a man to pay attention to me. I lost weight but he didn’t notice and I was devastated. I thought it was my fault so I started emotional eating and yo-yo dieting, losing weight and gaining back 10 extra pounds each time. I joined Weight Watchers (3 times), did the Atkins diet, Thin 4 Life, and abstaining from sugar and flour. Six years ago I found the mindful eating program and I am forever done with diets that don’t work! Now I eat what I love and love what I eat AND am living a big beautiful vibrant mindful life. It’s been an amazing journey that continues today. list of programs that work but did not last: weight watchers, low carb high protien, ketogenic, green tea, weight lost doctor with injections and phentermine, south beach, atkins. i started with Weight Watchers in my teens. Then I joined LA Weight loss and used diet pills, diuretics and low calorie diet, Atkins came next. Then another spin on the WW wheel a time or 2 more. I also joined HMR program and was told that I needed to eat only 1100 calories and work out 70 mins per day (after working a full-time job and having 2 kids at home.That;’s when I gave up somewhat but dieting mindset has taken longer to get over. When I gained 15 lbs. my freshman year at college, I basically starved myself by eating salad at lunch and lean meat for dinner, if they offered it at the dining hall or a can of tuna, if they didn’t. I got so weak I couldn’t participate in my tennis class. That’s when I started bingeing. Then I tried Weight Watchers, at least 3 times, a hospital-sponsored low-calorie, controlled portion plan, a wellness eating program & Overeaters Anonymous. I’ve read at least 20 diet books offering various diet plans that I followed on my own for some period of time. The most recent (and last ) diet was in November of 2017, on the recommendation of my doctor due to my blood glucose being 110, I went to a registered dietician who put me on a diabetic exchange plan and weighed me every time I saw her. When that diet failed me (& ironically my blood glucose has not been over 100 since), that was when I committed to AIH and promised myself I will never diet again! I have tried various diets over the years. Here is my list! I also did a 3 day cleanse and hated it. I felt very hungry and very miserable. I’ve tried intermittent fasting and only last about 12 hours. I don’t like feeling so deprived. I’ve tried Weight Watchers, Slim Fast, OA, OA How, A personal trainer ( I thought that was the non diet version to lose weight) The Diet Center, Learning Clean eating the Rosca Reno, Accountability groups. And I was one that really didn’t believe in diets, but if I did one it would be a healthy version. I have Deep brain stimulators, take 15 + medications, I have Young Onset Parkinson’s Disease and CLL with complications. My breakfast like a Queen, lunch like a loyal and dinner like a bum. I’m excited to start your program in April! I tried Weight Watchers many times. I got to my goal weight once when I was still in my 20’s. I regained the weight each time I got pregnant. I tried Diet Center, but the calories limit was so low that I couldn’t think properly. After I drove past my own house and couldn’t recognize my best friend’s mother, I decided not to do that one. I lost quite a bit of weight using the MyFitnessPal app and 6-week sugar-free sprints, but could not keep up the motivation and gained almost all of it back. One thing that was semi-successful was a plan (I forget the name) where I could eat anything I wanted as long as the food was an amount the size of my fist. I was not supposed to drink water less than 1/2 hour before my meal so that I would not stretch my stomach with liquids. I got tired of it and went back to Weight Watchers, though, due to social pressure (my friend is a Weight Watchers instructor). I also tried Overeaters Anonymous. I have a long history of restrictive diets many of which I worked for as a coach-leader. They include Weight Watchers since it began, Jenny Craig, Optifast and HMR, health management resources. That’s approximately 45 years eat-repent-repeat!! It’s taken awhile to learn how to eat mindfully but is well worth the journey! I forgot I did a 3-day fast in my 20’s where all I consumed was vinegar and honey in water. I think I did it on 2 different occasions. It was horrible! I’d go out to eat with my husband and watch him eat steak and a baked potato. Anyone who calls dieters weak-willed doesn’t know what they’re talking about! I started with Weight Watchers at 10 years old. Tried every plan for the next 50 years. Tried the Weight Loss Clinic (500 calories/day with daily weigh ins). Also Overeaters Anonymous – no sugar, no white flour, only 3 meals a day. Ready for a big, vibrant life free of food obsession. I remember in elementary school my mom put me on a grapefruit diet. Then I remember some type of chews that I ate before each meal that was supposed to fill me up and not eat as much. I saw a dietitian while in college. I’ve dieted without following a specific “diet.” Weight Watchers worked a couple of different times and the last thing I’ve done was to have Bariatric Band surgery and I lost weight with it but have gained the weight back. Each program netted reduction of around 80 lbs. Though not sustainable. Ayds (diet aid to reduce appetite) – mom again pushing it. All this destroyed my metabolism and I could gain weight on 1400 net calories per day. When I stopped restrictive dieting, I became SOOOOO much happier – lost all the judgement of myself, even after gaining some weight. I also think I was headed for an eating disorder so I’m glad I using food now for fueling, enjoyment instead of it being the enemy. I’ve been dieting since I was 14. I always regained the weight that I lost plus some so that I dieted myself all the way up to super obesity. I’ve ended up with insulin resistance as a result of all of my excess fat, which makes it even more difficult to lose weight. Thanks diets – not. – Doctor prescribed diets – what foods to avoid, how many calories to eat, etc. In the 70’s “Disraeli (incorrect spelling) Army Diet ” – 2 days apples (choose one variety), 2 days cheese (choose one type), 2 days chicken (no skin) and 2 days salad. So other than the obvious boredom, feelings of deprivation and hunger, the apples give you diarrhea, the cheese constipation – BUT if you can stick it out you do drop significant weight and lose your sanity. I am almost embarrassed that my mum and I did this. My first ever attempt at losing weight was Atkins – 20-net carbs. Made it the two weeks, noticeable weight loss, but, I missed my sweets. Then I don’t think I tried anything for 20 years until I tried WW Points Plus, lost some weight then, but wasn’t happy eating the diet foods. Been trying their newer programs to help cut down on my sugar, but, going over my point allotment everyday is discouraging. I’ve done Walk away the Pounds too, but that is more exercise I believe. & calorie counting at some point. Weight watchers 2 or 3 times, couple other smaller programs. Worked for Bob Schwartz author of Diets Don’t Work was successful. Got back to thinking in the diet mentality. Did HCG again, twice, tried no carbs. Relearning again how to pay attention to my signals my body tells me. Thirsty, tired, sad, hungry, not just food tastes and textures, temperatures. I’ve done no carb when I was in my teens, Atkins, counting calories, cabbage soup (yuck! ), Slim Fast, First Place, Weight Down Workshop, and Trim Healthy Mom (it’s actually Mama, but I’m from the north and I can’t get Mama out of my mouth). That’s 42 years of on and off dieting. I started believing the lie that I just can’t lose weight. It’s all very discouraging. And you are right, none have worked! Because each time, I have gained back all the weight and more.